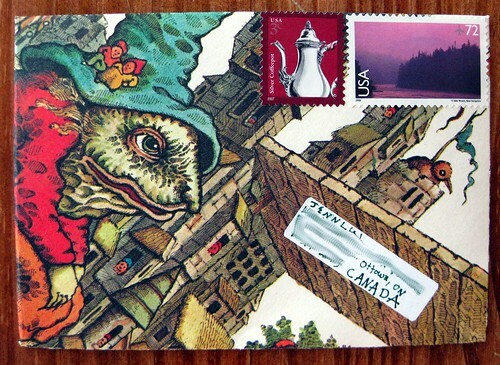 So yesterday I posted about this wonderful mail art that I received. That, too was a photo-heavy post, and at the end I promised to show you today what I sent in response. 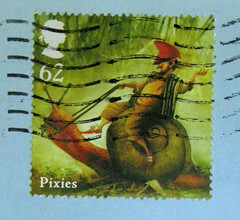 Of course I had to send something I made myself, it had to be some sort of mail art, so this seemed the perfect opportunity to really dig in with the items from my recent PaperSource order. 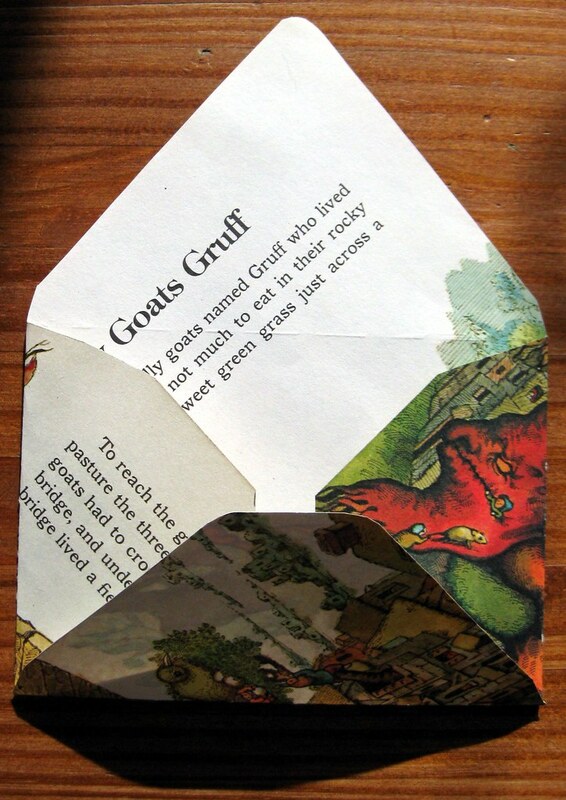 Here we see the envelope template centered on the page of a children's book (Favorite Tales of Monsters and Trolls by George Jonsen - this is the troll under the bridge in The 3 Billy Goats Gruff). I will note that I deliberated over this template kit for a long time - some people are really crafty but I'm not one of them, and I need all the help I can get. What really sold me was the fact that you can see through the firm plastic, so you know exactly where you want to center it, and the long holes are places where you can use the bone folder to score for folding. This kit is really, really handy. I will just say right now that I love it. 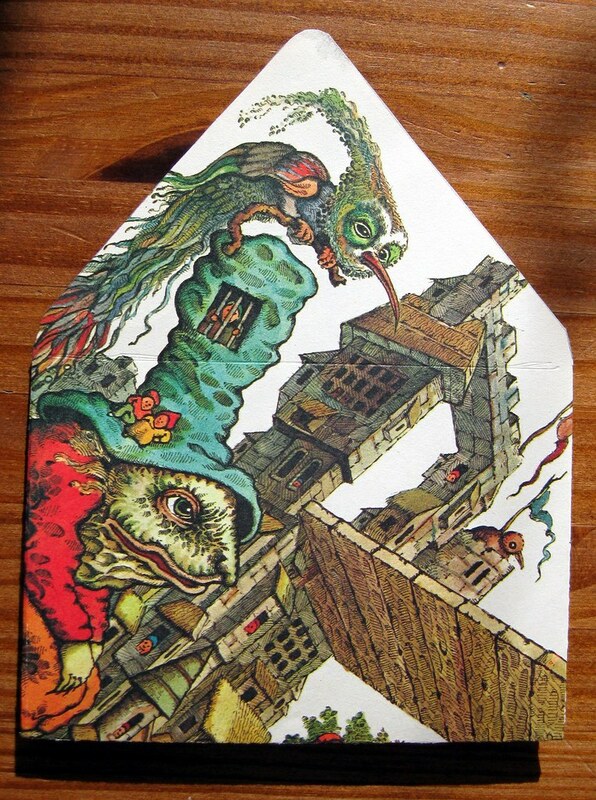 So in this case I wanted to make sure that the troll's face showed up on the front of the envelope, and that the awesome bird on his hat came out on the back flap. This template is just a wee bit bigger than the page (and it's the smallest one in the kit), but it's okay that it overlaps the page in a couple of places - those irregularities will be totally covered by the folds. My spatial-reasoning challenged brain would not have known this without the aid of the template. Here we see the page, the template and the bonefolder. 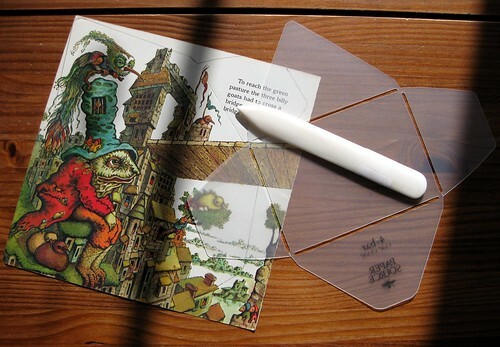 I traced around the edge of the template with a pencil, and used the pointed end of the bonefolder to score the page. 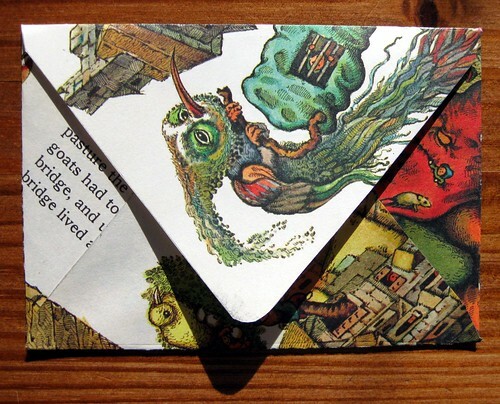 (That means to put little indentations in it that aid in the folding of the envelope.) 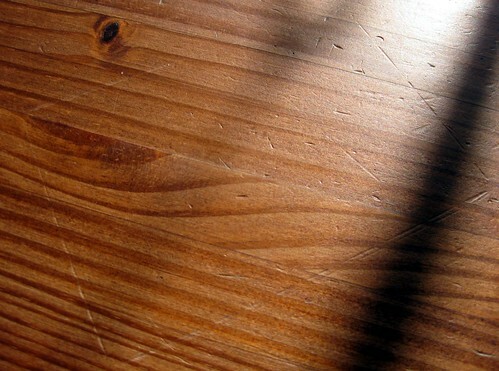 Sorry about all the shadows from my windowpanes - it was a directly sunny day, and they couldn't be avoided. Now I understand why people have craft mats - the bonefolder actually made marks in my table. Good thing we don't really care! It's already got cat claw marks, ink spots, and all kinds of other marks of our lives. But I shall be a little more careful with the bonefolder in the future, and maybe put something underneath it when I am using it to score. ...and more folds, pre-glue. I did not photograph the glue process, but let me just say that the Lick & Stick glue is probably the best value. It's only a couple of bucks, and that stuff is glorious. You can use it wet as normal glue, of course, but you can also let it dry so that you can lick and seal the envelopes later. 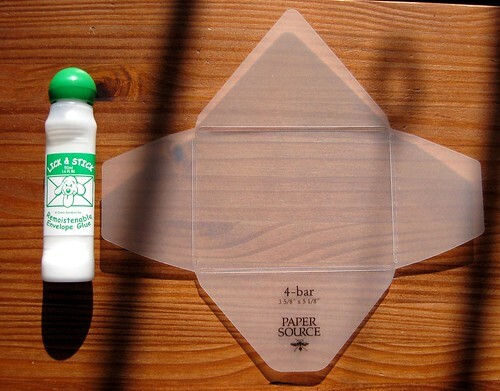 This is fantastic if you are making your envelopes ahead of time, before you are sealing them, or of course if you are making them to give away or sell. I have heard tell that you can mix up your own solution for this sort of thing, but again, that's not my temperament. The Lick & Stick is easy to apply, with a spongy applicator, and I've found it's also good for reinforcing the glue on vintage stamps. Hooray for Lick & Stick! Here's the front, before the final fold. 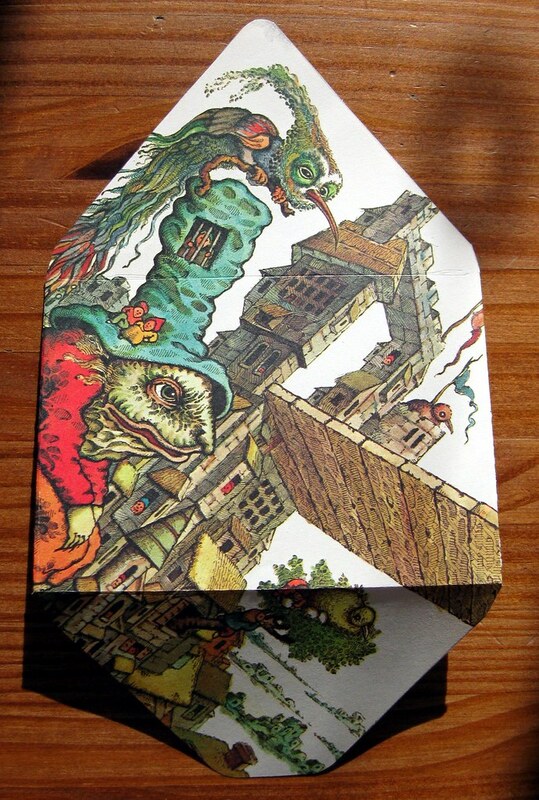 I just so dig that bird on top of the troll's hat. Here's the back, when the envelope itself has been glued together but the flap hasn't been sealed. 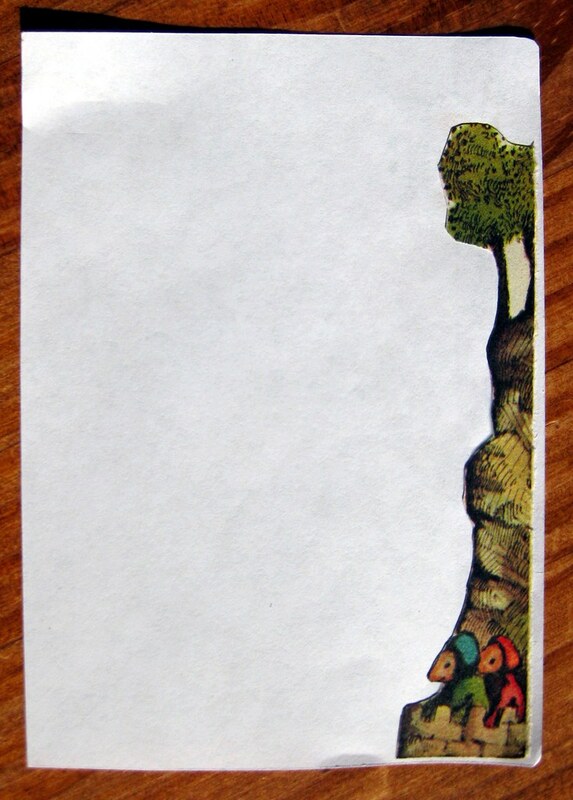 I didn't photograph it before I cut it, but one of the strips from the page I used for the envelope had this really cute scene on it, and it was cut away from the final envelope. I decided to cut it out and glue it on a piece of paper (yay Lick & Stick! ), so the "stationery" matches the envelope. 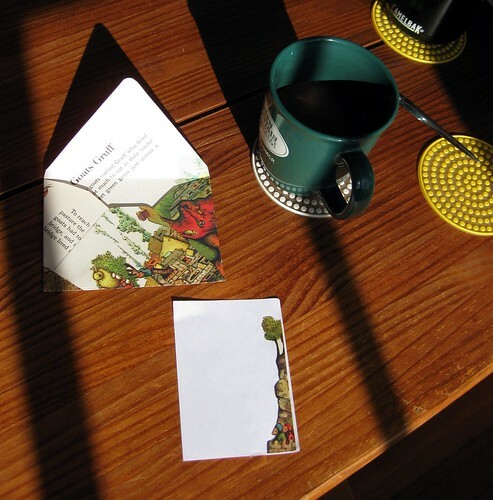 You can also see my morning cup of coffee there in the sunshine. Here's a closer look at that little scene glued to the paper. All things considered, I am really happy with these PaperSource purchases, and I'm sure they'll see a lot of action. The Envelope Template Kit has a great video that demonstrates their use; though it is a bit annoying to watch, it is useful. It has templates for 4bar, A2, A6, A7, and 5 3/4" square envelopes. I hope you enjoyed the heavy documentation of my creation, and found the info useful - zowie was this an intense post to write! But good mail is worth it. Such a beautiful envelope again! And I really got interested in your envelope template kit. 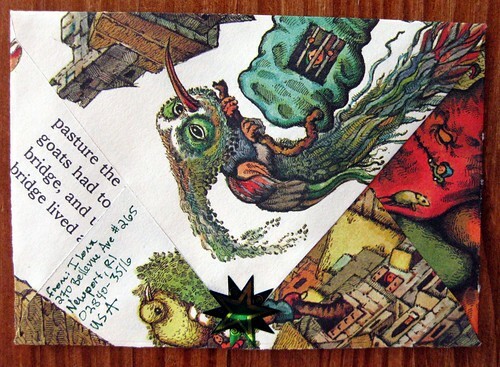 I a bit earlier already got interested in Enveloper in this blogging http://arewethereyet-jam.blogspot.com/2010/01/mail-art-handmade-postcards.html but now I think your envelope template looks even better. Have you tried the Enveloper? i just love that envelope! your kit really made it professional and your choice of the book page is a great one too! Sirpa - I've not used the Enveloper. The Barnes & Noble info was very minimal, so I did some google searching and found a video that shows how to use that tool. I didn't watch all 14 minutes, but it was clear from a few minutes in that that tool and its process are not for me. This is awesome!! What a lucky person Jennlui is to receive this. That enveloped turned out great! :) I have a few envelope templates, but I still haven't gotten a bone folder and I think I'd like to try the Lick & Stick glue, too. Gorgeous images! 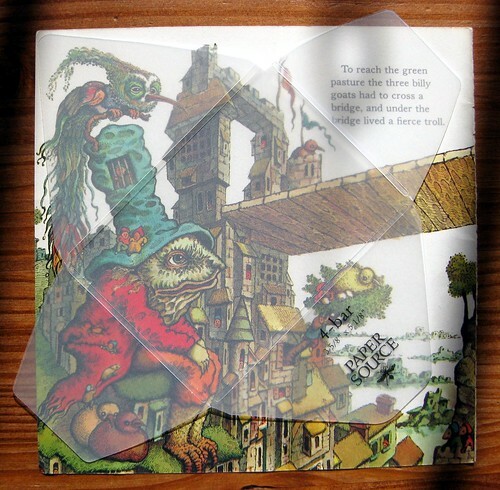 I have a lovely book, The Envelope Mill, that came with templates, but I lost the most useful one, the A6 size. So, me being the ever-so-practicable one, I have to ask ... did you have to pay the 20¢ non-machinable fee because the address is not horizontal to the long side of the envelope? I thought the non-machinable fee was based on stamp placement, not address orientation...? Good gravy, it's anybody's guess. It took me too long to find this on the USPS website, but here are the very vague nonmachinable guidelines. Ah - since the guidelines state that it is nonmachinable if the address is parallel to the SHORTER side of the envelope, perhaps I win this one. It probably depends on who's handling it, as do most things. Non-machinable is subjective. It makes me nuts. If I take something to the post office in the city, I can usually get away without non-machinable fee, but if I put anything remotely questionable as non-machinable in my mailbox for local pick-up, it will come back postage due the next day. I think the clerk at the post office in the city likes me so I don't mind going in. She gave me a very cool Ayn Rand postage stamp. I never realized that people made tools to make your own envelopes even easier. I thought people were just cutting them out on their own, and I knew I could never try *that* myself. Now it seems like a possible thing to do someday. I'm not even the slightest bit crafty, but that envelope template thingy is pretty cool. Good job Ilona! Did you know in folklore that trolls are supposed to turn to stone in day light? That is why they only come out at night! In future letters to this friend be sure to tell her to open the next troll enevelope in the morning so she will be protected from the letter troll lol! P.S. I love that Ayn Rand stamp. I wish I could find them at the Post office here. I found the image of it online. I also came to identify with Ayn Rand since some of the writing in my current book reminded a person of her work. Wow, I had an envelope template long ago, and I couldn't stand it. This one looks so much better. Thanks for the review and pics. What a very cool template! Thanks for sharing! I need one of those templates in my life! AWESOME! That's super cute! I would hate tearing up a book though. This is my favorite childhood book! It looks delicious as an envelope! I would have to color copy it though. Thanks for the fab memories! Luckily, I do have a copy of the book! :) I even did a drawing of said troll. Wow, that is just so cool! But, how do you know what size template to use? Like, if you have A5 paper, would those templates work for it? Matt, I decide what size template to use by putting a few possibilities on top of the desired page/paper. I pick the size that best fits and frames the image I want to use. With all the triangle edges, it does take a fairly large page to make it work. The example shown here is the smallest possible template.